well for the show's next instalment coming up in 2020. Long established as the gateway to Africa's timber trade, WoodEX for Africa's milestone fifth edition, which took place from 11-13 July 2018 at Gallagher Convention Centre in Midrand, Johannesburg, alongside the inaugural Deck & Flooring Expo, was a resounding success for all stakeholders and bodes well for the show's next instalment coming up in 2020. "Since we launched WoodEX for Africa in 2012, the show has grown robustly year on year and increasingly enjoyed a strong African visitor profile, which makes up a substantial percentage of our international trade visitors this year," remarks Stephan Jooste, WoodEX for Africa Director. "WoodEX for Africa 2018 was a much larger event than the 2016 show, with almost double the number of brands and exhibitors on show; it also showcased a notably more diverse offering and enjoyed unprecedented exposure to both visitors and exhibitors from close to 30 different countries. This was in part due to the inclusion of the launch edition of the Deck & Flooring Expo, which broadened the horizons of the shows combined and added significant value for exhibitors and visitors alike." The organisers of WoodEX for Africa saw an opportunity in the market for deck and flooring suppliers and professionals to showcase their products and services to a tuned-in audience. "This gave us the impetus to launch the Deck & Flooring Expo in 2018 alongside the fifth instalment of WoodEX for Africa. The outcome was a tremendously well-received and successful new expo brought to market and a rich diversification in offering for WoodEX for Africa. Our exhibitors have shown immense support for this co-location and visitors were delighted to have so much more to see, learn and buy in the decking and flooring space. Even though the Deck & Flooring Expo has only just launched, its first show far exceeded our expectations. The two shows combined are poised for exceptional growth in the coming years and we look forward to driving this success," Jooste comments. Survey feedback from both visitors and exhibitors has shown that both would find significant value, not only in a full-scale conference programme delivered by industry expert speakers, but that a practical workshop element would make an ideal addition to both shows. "The invaluable feedback received from our stakeholders has confirmed for us that educational features and information-sharing have become vital elements of today's successful industry trade show. As such, a conference with top international speakers will be reinstated for both events with the addition of workshops, where visitors can benefit from a more practical showcase and live-action demonstrations for the general trade, industry professionals and DIY enthusiasts," Jooste notes. "Based on both quantitative and qualitative feedback from all our valued stakeholders as well as internal assessments, the milestone fifth instalment of WoodEX for Africa and the launch of the Deck & Flooring Expo were resounding successes, made possible by the immense support the shows enjoyed from all stakeholders, including sponsors, show and media partners, exhibitors and visitors," Jooste remarks. "While the current economic climate in South Africa has impacted on all business in the country, the turnout at the event and the enthusiasm of all involved reminds us that South Africans are a resilient bunch that do not allow much to get in the way of success. WoodEX for Africa 2018, combined with the Deck & Flooring Expo, represented, yet again, an essential platform for dynamic networking with a high-quality and appropriate audience, which is poised to yield very lucrative business opportunities well into the future," he concludes. 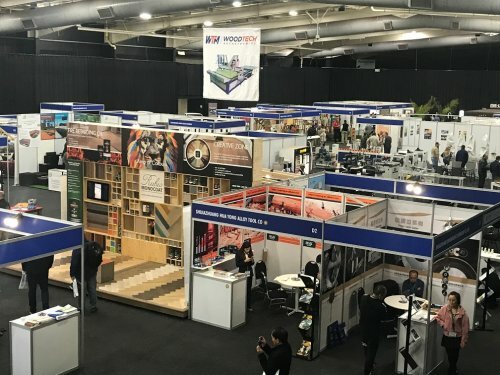 WoodEX for Africa and the Deck & Flooring Expo will be taking place again in 2020 at Gallagher Convention Centre in Midrand - dates to be announced. Bookings for the event are now open and exhibitors are encouraged to secure their space early to unlock maximum exposure leading up to the event. For more information about exhibition space, contact Annelize on +27 (0)21 850 8846, +27 (0)81 775 5859 or email info@woodexforafrica.com.